THQ sold UFC to EA because its ROI was NFG. I said a couple of days ago, when the news that THQ had sold the rights to Ultimate Fighting Championship videogames to Electronic Arts first slipped out, that it was a surprising move because it fit well with THQ's new core-focused strategy and appeared to be one of its few reliably successful franchises. But it turns out I was wrong. UFC Undisputed 3, THQ's last UFC game, came out in February and has thus far failed to meet its break-even sales mark of two million units, company management told analyst Michael Pachter, despite being the third-best-selling game in the U.S. in its first month of release and with initial sales that THQ said in April were better than expected. 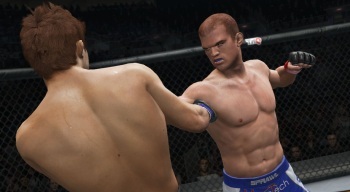 The previous edition, UFC Undisputed 2010, also failed to live up to expectations, which THQ President and CEO Brian Farrell blamed in part on its proximity to the first game in the series, UFC Undisputed 2009. That game sold more than 3.5 million units and at the time appeared to establish a solid foundation for the franchise. It's not known how much EA paid for the UFC license, but there's no doubt that THQ could use the money; even though it reported better-than-expected results in its last financial quarter, the company is still struggling to avoid a Nasdaq delisting and keep itself afloat.